Being in the presence of a huge live oak tree that may be older than half a millennium and has survived hurricanes and floods is awe-inspiring enough, but even more so is the story of the determined young woman who set out to save the tree from destruction. 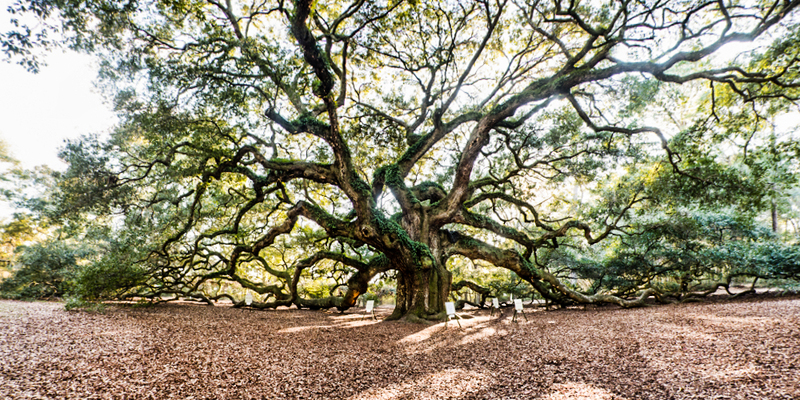 When I was looking at images of Charleston, South Carolina recently, I ran across pictures of an amazing old tree called the Angel Oak, which captivated me. It looks like something out of a beautifully illustrated children’s fable. I discovered that it wasn’t too far from the B and B we were booked to stay at. I really wanted to see this unique tree and pay homage to its fortitude. I thought I’d like to try a panorama shot of the tree. But once I dug a little deeper and found out the whole story behind it, I was even more eager to make the visit. 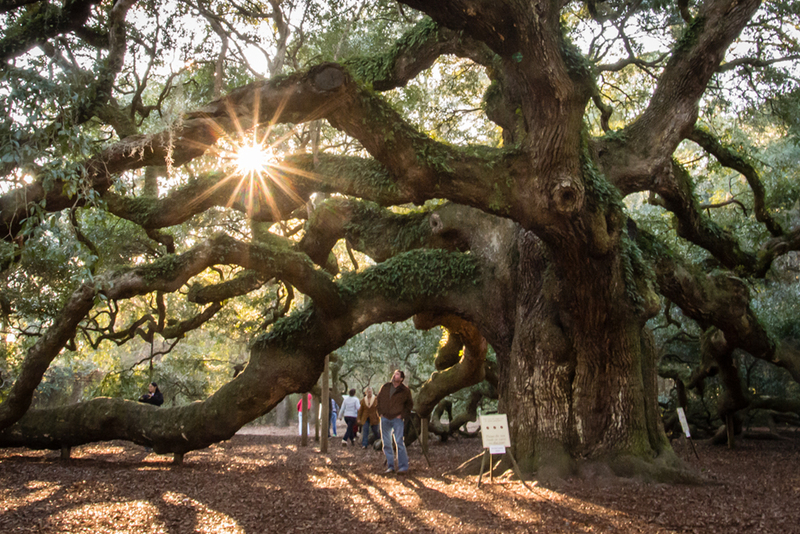 The Angel Oak Tree stands 66.5 ft (20 m) tall, measures 28 ft (8.5 m) in circumference, and produces shade that covers 17,200 square feet (1,600 m2). 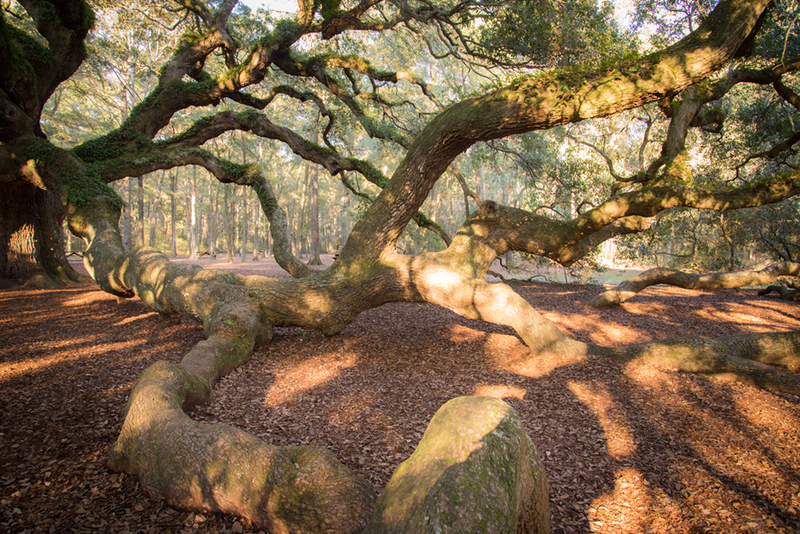 There is considerable debate about the age of the Angel Oak. Some contend that it is more than 1,000 years old. Most believe that it’s probably more like 400 to 500 years. BUT STILL! Not only is this the story of a tree that wouldn’t give up, it’s the story of a young woman named Samantha Siegel, who also refused to give up. Samantha had loved the tree all her young life — and had even written a novel featuring it. Angels Living in Trees: A Brief History on Roots tells the stories of the women who have lived around the tree over the centuries, from a Native American to a slave, to Martha Angel (the tree’s namesake) to a modern day woman, Sophie. 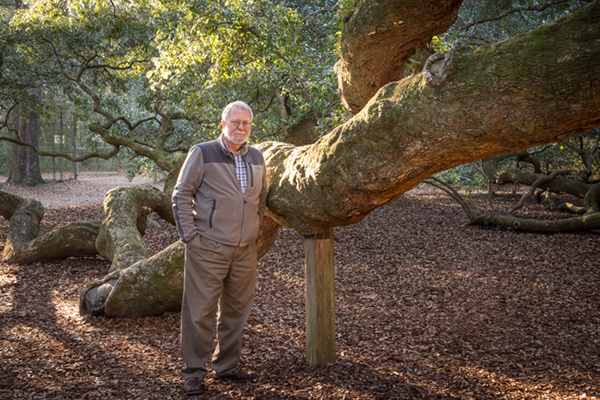 Siegel wrote the book in the shade of the Angel Oak’s branches over three months in 2007. When she found out in 2008 that the land around was slated for development she feared for the tree and determined to mount a campaign to stop it. Initially it was a one-woman campaign because although many signed her petition, nobody thought there was even a slight chance she could actually change anything. She was quoted as saying: “Every city employee, every government employee, said, ‘It’s a done deal. There’s nothing you can do,’ and looked at me like, ‘You poor, little, young, idealistic girl. You’re not going to make a difference,'” says Siegel. It was a long, hard, complicated battle. Samantha and her supporters spent huge swaths of time doing meticulous research, gathering supporters, and constructing road signs to oppose the development. They set up a web site and organized public meetings. In the end, Samantha instigated enough public awareness and support that adequate funds were raised to purchase the land immediately around the tree and a parcel beyond that. Development was stopped. Here’s a short video of the tree and a remarkable young woman who wouldn’t take no for an answer. Thank you, Samantha. Such an inspiring story to start the New Year. I was one of the petition signers Sherry. The tree is about 15 minutes from my home on Kiawah. It is absolutely astounding and despite your or anyone else’s best efforts, simply cannot have its majesty captured in a photo. The fight to save it (it was never being torn down but development would have been very near it) was fierce and in the papers locally for months. Unfortunately for photographers they no longer allow shooting before or after hours, and they’ve but up so many signs it’s hard to get a pure shot. But nothing can spoil it’s glory, which you’ve captured quite well. Thanks for highlighting one of our local treasures. Did u make it to Kiawah while u were here? incredibly inspirational. Thank goodness she shifted into action. What a unique tree and oh the stories that it could tell! Sherry, beautiful storytelling combined with your magical images makes this so inspiring and compelling. Thank you for sharing. Such an amazing story to read about…and I’m glad Samantha was able to make a difference in stopping the development. I was in awe of the one I saw in Alabama. Maybe one day I’ll get to see this grand one! Thanks for this post, Sherry – what an amazing tree…it’s like a whole forest unto itself! Samantha is indeed inspiring. Thanks also for explaining what a “live oak” is – I have always wondered why they are called “live”, when our Garry oaks and other oaks here are also very much alive! Wishing you a happy new year and safe travels. Great to see something that has lasted so beautifully when so much of our modern world is “throw-away”! Awesome and grand, such a story. How wonderful that you found this, that would have made my day to have seen this. A Grand Lady both the tree and Samantha. What a simply gorgeous tree and your photos of it are just lovely. I’m a huge tree lover and have been known to talk to them when I encounter them! Oak trees are so majestic. Well done to Samantha for her initiative to protect this beautiful tree with such an amazing history behind it. Thanks to you too, Sherry. Wonderful, Mary. You will love it, I’m sure. I will be in Charleston next week with a friend who is traveling from Florida. 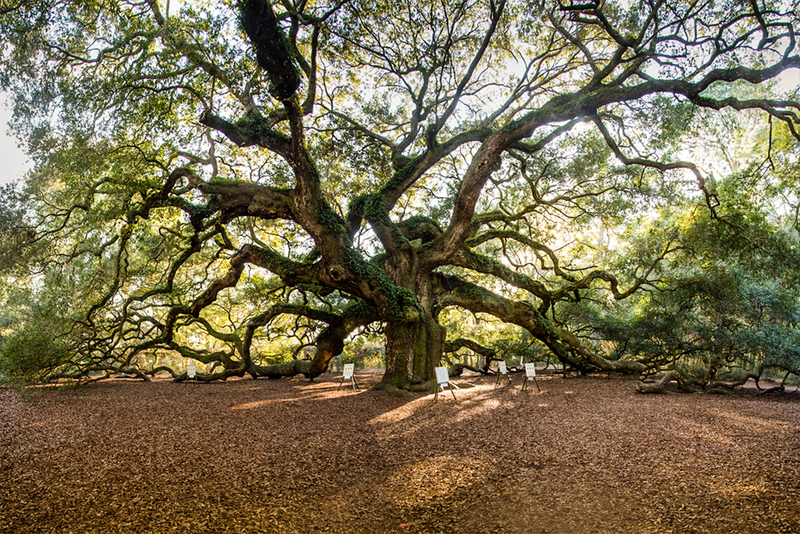 We have the Angel Oak on our list of places to see! Thanks for sharing this story! I can’t believe they were going to knock that tree down. It’s a masterpiece. Yay Samantha! This is a beautiful story of a woman’s dedication to save a very special tree. We have those same trees on St. Simons Island, Ga. and they are amazing with their long sprawling limbs…..
That is an outstanding story for one outstanding tree. I grew up in southern Louisiana where we climbed on the limbs of live oaks. Love the trees. Love the story.